Standing in for JonofWales with some trepidation on a Thursday, I was delighted to see Klingsor’s name – I’m a bit of a fan, you see. He didn’t disappoint, with plenty of ingenuity to keep me gripped and some beautifully constructed clues, including a generous serving of &Lits (where the definition is also the wordplay & the whole clue). Mind you, there were a couple I couldn’t parse (1a, 27a) and one, 21a, I gave up on. Maybe if I’d left it and come back later in the day it would have been obvious, but with the answer just a computer click away and a blog to be posted, I gave up at the death. Just right for what is traditionally a fairly stiff challenge sort of a day (for some reason) I can see why its original Monday appearance raised a few eyebrows over at Fifteensquared. Genius, I thought, even if it was one where you get it and only realise why afterwards. One of us is having a bad day, and judging by the uniformly approving comments over at Fifteensquared it must be me rather than Dac. 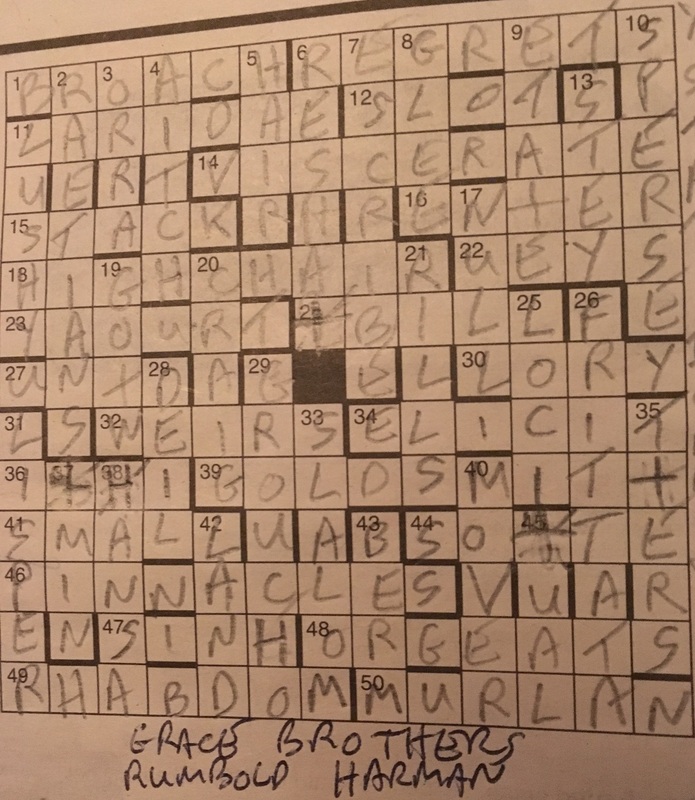 I thought that this puzzle fell a little short of his usual standard – which is beyond criticism, of course – with rather too many elementary write-ins. 4, 16, 17, 21 and 26 all seemed pretty thin, for instance. On the other hand 11 and 24 caused curling of the lip simply because I dislike the words. 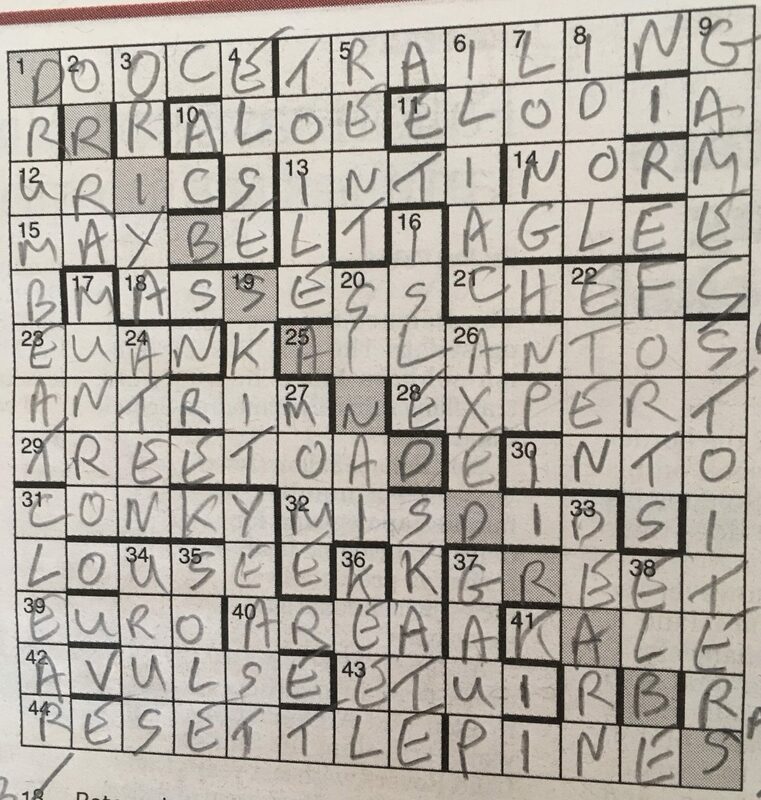 This crossword first appeared in the Independent in April 2013. Welcome back, as a hush descends on the house on Inquisitor day – yes, thankfully, the youngest two have been invited to a birthday bash, and it’s just warm enough to sit outside. So to a garden chair with Phi’s latest offering. Five acrosses and five downs have wordplay referencing an extra letter, some unclued entries, a greyed out diagonal, put the first with the last to work out what to do with the bits in the middle. What could possibly go wrong. As it turns out, not a great deal. Lots of clues that wouldn’t look out of place in Phi’s weekly prize cryptic, extra letters that are very forthcoming, and a diagonal it quickly becomes apparent is going to read DRIBS AND DRABS. So what about those extra letters? The across ones read BIRDS, the downs BARDS. So I’m guessing the unclued entries are going to be anagrams of birds and poets in the acrosses and downs respectively? Yep. TOILE for ELIOT, LOUSE for OUSEL, and so on. A little head scratching, a few poets I wasn’t sure of, a little help from an anagram solver, and… That’s our completed grid. A shortish blog, sorry Phi, for a thoroughly enjoyable puzzle that was definitely at the easier end of the spectrum, solved in about half the time I usually manage these. Deliberately, I suspect, after a couple of tricky offerings earlier in the month, or in anticipation of something more difficult to come? So until next time, when the question is, will it really be a total wipeout? “Start as you mean to go on, Morph”, I muttered to myself whilst writing in my first entry, 9/12, and that’s pretty much what he did. This was quite a slangy crossword, and there was an instance of ribaldry the likes of which we haven’t seen for a while. Makes a change if you ask me, but this sort of thing isn’t to everybody’s taste. Mind you, there were a few other clues from Phi’s top drawer, plus an interestingly light use of anagrams, so this was all things considered one of my favourite Saturday offerings in a while. Just a few in the SE corner which held things up at the end until my sister came to the rescue – but she’s the sort to polish off the Inquisitor in a couple of hours, so consulting her feels a lot like cheating. Update: Now that I’ve seen the 2013 blog here, it turns out that there is a theme – of Star Trek captains – Way, Archer and possibly one or two more hidden in the unches – not my specialist subject though! In the comments section Phi opines that ghost themes are the best sort of themed puzzles, and says why. I agree with him, although I would add that I think they are best when flagged clearly enough for a significant minority to spot them (rather than a minority of one!). Is this the first daily cryptic from External we’ve had in the i? I think it might be, and wasn’t it good? On the tricky side for an IoS reprint, but solvable with a little thought, and a little care taken with the sometimes very well disguised definitions. That said, much was solved while waiting anxiously in the car for the oldest to return with his first set of GCSE results, so I wasn’t as focused as I perhaps could have been. Last in the SW corner, where I couldn’t think of the viewing area for an age, and wasn’t that confident about the (correct) answer for 16ac. 25ac I was pleased to tease out from the wordplay. COD? 1d – “Resign? He’s close to the boss (6-2-7)”. Just because the answer might have been obvious, but the cryptic bit was very nicely done. A little on the tricky side for Dac I thought, with steady but slowish progress throughout. I didn’t know the duck at 1ac, or 12ac – though what else could it be? First in was 5ac, last in 19ac where a hasty EXTENSION for 16d stymied me for too long. One or two where I couldn’t work out what was going on, including the aforementioned 16d. That’s my excuse anyway. As enjoyable as always, confident that with a little perseverance I’d be able to finish. COD? With lots to like, I’ll go with 18d – “Gather fruit, topping for Belgian waffle (7)”. So after a difficult couple of weeks with the IQ, has Eclogue got something easier in store? First impressions (after noting that pesky black square is present in the centre of the grid for the second week in a row) aren’t encouraging – a preamble that is about as clear as… well, something extremely unclear. Definitions scrambled with an extra letter, use them to form the start of a thematic “opening”. Clashes we enter with a cross – going to be lots of letters then – and a bit of jiggery pokery at the close. Confused? Dive in and hope for the best. Which of course is the start of the Are You Being Served titles. Well, that was fun. An easy one at last, and more comedy gold from the Inquisitor. Interesting fact of the day gleaned from Wikipedia? If it wasn’t for the Munich massacre, Are You Being Served’s pilot episode might never have been shown. Nice. So until next time then, when we have Phi, more Phi, and yet a little more Phi.